Pigeons and other nuisance birds such as starlings are comfortable living in an urban environment where they tend to scavenge for food, often in substantial numbers. They are able to breed all year round and often choose to roost on signs or the rafters of commercial buildings. The droppings they produce are not only unsightly but can cause long term damage. Fresh droppings, whilst unpleasant, pose no risk to health. It is dried droppings, which can be inhaled as dust and carried on the wind, that can potentially spread infection. 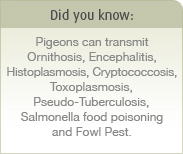 Pigeons have been known to carry diseases such as pigeon ornithosis, encephalitis, histoplasmosis, cryptococcosis, toxoplasmosis, pseudo-tuberculosis, and salmonella food poisoning. Agouti Pest Control are experts in implementing bird and pigeon control solutions to help you prevent bird and pigeon infestation for clients across Essex, Kent, Hertfordshire and London. An Agouti Pest technician will employ a variety of techniques include large bird and pigeon nets, taut wires or blunt anti pigeon spikes which can be put on buildings to keep them off. Alternatively, stupefying materials may be used or cage traps be set to catch pest birds, which are then humanely destroyed. For your FREE Pigeon and Bird control and eradication assessment and quotation contact us today.